SiteMaster Building LT is the ideal starter mobile CAD package for anyone wanting to take advantage of the Bluetooth functionality in the latest range of laser tapes from Leica such as the DISTO D3a BT or DISTO D8. This intelligent mobile drawing package which supports .dwg format allows the user to quickly and accurately create floorplans on site by capturing the measurements taken on the Disto D3a BT or Disto D8 and entering them directly onto the drawing within SiteMaster LT.
SiteMaster Building LT gives you all the flexibility you need as starter package with an easy upgrade through to the full version should the so wish. The Camera function allows you to insert icon-referenced inspection photos and images. (Full version only) SiteMaster Building contains an Image function for direct insertion and scaling of photos and image underlay’s with support for file formats as BMP, JPG, PNG, TIFF and RLC digital photos and images. VoiceNotes that can easily been inserted eliminate time-consuming text markup by providing record and playback of high-compressed audio notes and instructions directly inside your drawings. AutoCAD-compatible drawing symbols / blocks can be used. 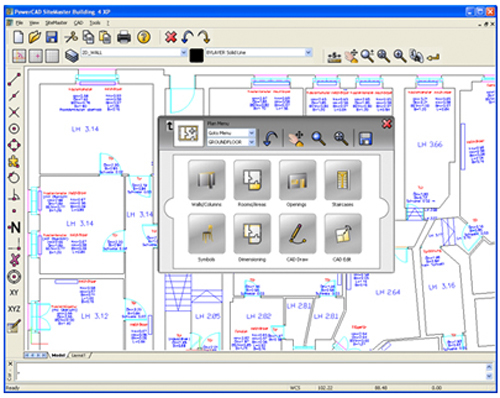 The Visual Symbol Manager lets you insert symbols ? (Full version only) as-measured, referenced or free in the drawing. You can export Excel-compatible .csv files with room/area lists and room schedule reports/symbol lists. The Check Distance function lets you compare »as-built« distances to plan distances and record this comparison. 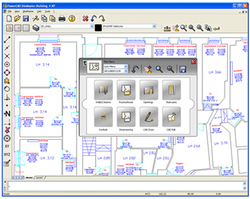 Once you have completed and saved your floorplan in SiteMaster this can then be opened in any traditional CAD program such as AUTOCAD or Vectorworks retaining all the detail, layers & measurement data you have recorded allowing you to rework the drawings back in the comfort of your office should this be necessary.